As reported in Post # 345, the SNOMED CT Concept SCTID: 192439005 Neurasthenia (disorder) and its associated SCTID Concept terms were retired (Inactivated) from SNOMED CT’s International Edition and from national editions some years ago. However, the Netherlands Edition retained the term neurasthenie under the SCTID: 52702003 chronischevermoeidheidssyndroom (CVS) Synonyms list. The neurasthenie term was exclusive to the Netherlands Edition, was assigned to the SCTID: 52702003 CVS code, and designated as an “Acceptable” Synonym term for CVS in the Netherlands Dutch language reference set. In October 2018, a Netherlands advocate approached Pim Volkert (Terminology Co-ordinator, Nictiz, and lead for the Netherlands SNOMED CT National Release Centre) with a request and rationale for consideration of removal of the neurasthenie term, for consistency with SNOMED CT International Edition and with the WHO’s ICD-10, which specifically excludes G93.3 from F48.0 Neurasthenia. This request and accompanying rationale was considered and promptly accepted for implementation in the March 31, 2019 release of the Netherlands Edition. Accept the License Agreement, if displayed. Select the specific edition required (eg the International Edition or one of the National Editions). Look under Options on the left of the Search box. “Status: Active and inactive concepts” from the Options dropdown. Enter a search term into the Search box. In the Matches list, Inactive concepts will display on a light pink ground. Click on a term to display the historical Concept Details panel associated with that specific term (which will also display on a pink ground in the box under Parents in the Concept Details panel). So although retired or “Inactive” terms can still be searched for within the SNOMED CT terminology browser, they are identified as Inactive by their pink ground. the proposal by Dr Tarun Dua (submitted November 06, 2017). If you are not registered for access to the ICD-11 Proposal platform, click to download the proposal submitted by Dimmock & Chapman in PDF format. Dr Tarun Dua is a medical officer working on the Program for Neurological Diseases and Neuroscience, Management of Mental and Brain Disorders, WHO Department of Mental Health and Substance Abuse. This WHO department has responsibility for both mental disorders and neurological diseases and disorders. Its Director is Dr Shekhar Saxena. Dr Dua had acted as lead WHO Secretariat and Managing Editor for ICD Revision’s Topic Advisory Group (TAG) for Neurology, which was chaired by Prof Raad Shakir. When Dr Dua submitted a proposal, last year, recommending that “Myalgic encephalitis/Chronic Fatigue Syndrome (ME/CFS)” [sic] should be removed from the Diseases of the nervous system chapter and reclassified in the Symptoms, signs chapter as a child under Symptoms, signs or clinical findings of the musculoskeletal system, it was initially unstated whose position this controversial recommendation represented. Read Dr Dua’s proposal in PDF format from Page 5 of this November 2017 commentary. TAG Neurology had ceased operations in October 2016, leaving proposals for the G93.3 legacy categories hanging and the terms still unaccounted for in the public version of the ICD-11 Beta draft. The terms were eventually restored to the draft in March 2017. Since early 2017, we had been advised several times by senior WHO officers that decisions regarding these categories were “on hold” while an in-house evidence review was being undertaken. Moreover, WHO senior classification expert, Dr Robert Jakob, had assured me (via email in March 2017) that WHO had no intention of dumping these categories in the Symptoms, signs chapter — yet here was Dr Dua calling for precisely that. The key question being: Did this recommendation represent the outcome of a now concluded evidence review or did it represented only the position of Dr Dua? Dr Dua eventually stated that “…the proposal [had] been submitted on behalf of Topic Advisory Group (TAG) on Diseases of the Nervous System, and reiterates the TAG’s earlier conclusions.” But neither Dr Dua nor her line manager, Dr Saxena, were willing to provide us with responses to other queries raised in relation to this proposal, including, crucially: How does this proposal relate to the in-house evidence review? We were subsequently advised by WHO’s Dr John Grove (Director, Department of Information, Evidence and Research) that the systematic evidence review would determine if the terms needed to be moved to any other specific chapter of ICD-11 and that the outcomes would be provided for review by the Medical Scientific Advisory Committee (MSAC). A formal response by Dimmock & Chapman to Dr Dua’s proposal can be read in PDF format here Response by Dimmock & Chapman to Dr Tarun Dua proposal of November 6, 2017. Importantly, the decision to retain the terms in the Disorders of the nervous system chapter is supported by the WHO MSAC and CSAC committees. It’s not known when the remaining proposals submitted by myself and jointly with Mary Dimmock will be processed. There remains a backlog of over 1000 unprocessed proposals, a number of which had met the March 30, 2017 proposal deadline and were expected to have been processed last year, in time for consideration for inclusion in the June 2018 “Implementation” release. • a 10-year cycles for updates to the rules. WHO has updated the proposal platform to allow voting by CSAC* members and to align the process with the historical practices of the URC [ICD-10 Update and Revision Committee]. 90 proposals have been identified from the platform for consideration by the CSAC this year, though not all of them can be reviewed in detail face-to-face during the WHO-FIC Network Annual Meeting 2018. A call may be held in advance to discuss some specific priorities. Given the huge volume of proposals, the meeting will go through the new procedures for the CSAC, review the voting process and tools, overview the proposal platform and how to use it, and determine timelines and workload for after the meeting. *The Classifications and Statistics Advisory Committee (CSAC) takes over the role of the ICD-10 Update and Revision Committee (URC). The last update for ICD-10 will be 2019. I’ve been unable to confirm whether the first update released after the June 2018 “Implementation” version would be a January 2019 release, or whether the June 2018 version is intended to remain more or less stable for a further year, until January 2020. If WHO were to accept any of the proposals contained within my individual submissions and my joint submissions with Mary Dimmock, for example, approving our recommendations for deprecating the prefix “Benign”; deprecating Postviral fatigue syndrome as lead Concept Title; assigning separate Concept Title codes to Myalgic encephalomyelitis and to Chronic fatigue syndrome; or approving Exclusions under Bodily distress disorder (BDD), any approved recommendations would appear initially in the orange ICD-11 Maintenance Platform pending their eventual incorporation into an “Implementation” release. I will keep you apprised of any significant developments. 4 8E49 Postviral fatigue syndrome, ICD-11 (Mortality and Morbidity Statistics) Maintenance Platform. Accessed November 22, 2018 The content made available on this platform is not a released version of the ICD-11. It is a work in progress in between released versions. In Post #342 (August 1, 2018), I confirmed that the addition of parent: Disorder of nervous system to Chronic fatigue syndrome was implemented for the July 31, 2018 release of the SNOMED CT International Edition. The SNOMED CT Concept term for Chronic fatigue syndrome is SCTID 52702003 Chronic fatigue syndrome (disorder). Benign myalgic encephalomyelitis; and Myalgic encephalomyelitis are included in a list of terms under Synonyms. SCTID: 52702003 Chronic fatigue syndrome (disorder) and the terms listed under Synonyms are now located under supertype SCTID: 118940003 Disorder of nervous system (disorder). This change to the International Edition is being incorporated into the national editions, as they release their next updates. These are released on a staggered schedule. Note that prior to July 2015, Postviral fatigue syndrome had been listed under Children to SCTID: 52702003 Chronic fatigue syndrome. But for the July 2015 release, Postviral fatigue syndrome was removed from under SCTID: 52702003 Chronic fatigue syndrome and relocated under supertype: Post-viral disorder under: Post-infectious disorder and assigned the Concept code: SCTID: 51771007. Note on inclusion of “neurasthenie” in the Netherlands Edition: SNOMED CT International Edition and national editions used to include a Concept term SCTID: 192439005 Neurasthenia. This Concept was retired (Inactivated) a number of years ago. However, the Netherlands Edition retained the term “neurasthenie” under the list of Synonym terms. “Neurasthenie” is designated as an “Acceptable” term in the Netherlands Dutch language reference set (open “Details” tab to view Netherlands reference sets). A Netherlands advocate has contacted Pim Volkert (Terminology Co-ordinator, Nictiz, and lead for the Netherlands SNOMED CT National Release Centre) with a request and rationales for consideration of the removal of the “neurasthenie” term, for consistency with the SNOMED CT International Edition and with the WHO’s ICD-10, which has an exclusion for G93.3 under F48.0 Neurasthenia. This request has been considered and accepted. I am advised that removal of the “neurasthenie” term is anticipated to be implemented for the March 2019 release of the Netherlands Edition. Note: the UK Edition has three severity specifier options listed under “Children” that are specific to the UK Edition. These are assigned the discrete codes: SCTID: 377181000000104 Mild chronic fatigue syndrome; SCTID: 377171000000101 Moderate chronic fatigue syndrome; and SCTID: 377161000000108 Severe chronic fatigue syndrome. It has yet to be established from NHS Digital in which year these severity specifier options were added to the UK Edition, to what extent they are used, and by what means clinicians would determine which of the severities to apply. The UK Edition includes the terms Myalgic encephalitis and Myalgic encephalopathy. SCTID: 55941000052101 | kronisk trötthet | [Chronic fatigue (finding)]. If your country is a member of SNOMED International but does not have a publicly accessible browser hosted on the International Edition platform or hosted on its own platform, please refer to your country’s SNOMED CT National Release Centre website for the release schedule. In Part One, I documented key developments around the potential revision of the G93.3 legacy categories for ICD-11. This report picks up from November 2017. November 06, 2017: Dr Tarun Dua (Medical Officer, Program for Neurological Diseases and Neuroscience, Management of Mental and Brain Disorders, WHO Department of Mental Health and Substance Abuse) posts a new proposal for these terms on the ICD-11 proposal platform. The proposal recommends moving “Myalgic encephalitis/Chronic Fatigue Syndrome (ME/CFS)” [sic] from the Diseases of the nervous system chapter to the Symptoms, signs chapter, as a child under Symptoms, signs or clinical findings of the musculoskeletal system. November 2017: Dr Dua and Dr Shekhar Saxena are approached by the Countess of Mar to provide clarifications. Dr Dua responds that “the proposal has been submitted on behalf of Topic Advisory Group (TAG) on Diseases of the Nervous System, and reiterates the TAG’s earlier conclusions.” but provides no other clarifications. Dr Saxena does not engage but passes the communication on to Dr Dua, who says she has forwarded the message to the TAG for its consideration. Nothing further is heard from any of them and the enquiries are left hanging. February 15, 2018: Dimmock and Chapman submit a robust counter analysis of Dr Dua’s proposal and submit further evidence on March 10. December 2017 – March 2018: In response to the failure of WHO’s Dr Shekhar Saxena and Dr Tarun Dua to provide adequate clarifications in relation to this proposal, the Countess of Mar is advised to write to Dr John Grove, Director, Information, Evidence and Research and Revision Project Lead to put on record significant concerns for the way in which the potential revision of these ICD categories has been handled, the lack of transparency on the part of TAG Neurology, Revision Steering Group and Joint Task Force, and their unwillingness to engage in dialogue. A systematic evidence review will determine if “the category” needs to be moved to any other specific chapter of ICD-11. The classification team organizes the review which is expected to be completed by mid April 2018. The outcomes will be provided for review by the Medical Scientific Advisory Committee (MSAC) and will be posted together with the relevant detail on the proposal platform. New proposals posted on the platform will become part of the workflows of the maintenance mechanism of ICD-11 and be processed in an annual cycle. 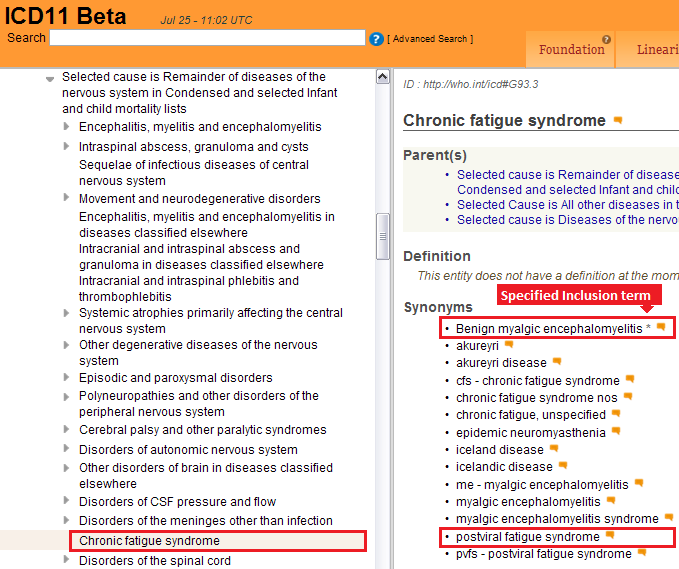 *NB: there is no concept term, ‘chronic fatigue’ in ICD-11’s Symptoms, signs chapter. There is a concept term: Fatigue (which was Malaise and fatigue in ICD-10). In March 2017, a long-standing proposal of mine for the addition of exclusions for Benign myalgic encephalomyelitis and Chronic fatigue syndrome under Fatigue was approved by the Beta draft admins, although the request for exclusion of Postviral fatigue syndrome wasn’t actioned and remains unprocessed. There are several speculative reasons for this: ICD Revision may be considering retiring the Postviral fatigue syndrome term for ICD-11; or retaining the term, but only as an Index Term. This might also account for Dr Dua’s reluctance to clarify what her proposal’s intentions are for the Postviral fatigue syndrome term. There has been no indication whether any evidence review was concluded in mid April, what the outcome was, or whether any potential new proposals for these categories are currently with the MSAC. But no new proposals from ICD Revision, the MSAC or Dr Dua’s department have been posted on the proposal platform or entered directly into the development draft (now known as the “Maintenance Platform”). Where does this currently leave these terms? This is how the ICD-11 MMS stood for the release of the “advance preview” version, on June 18, 2018. As released in June 2018, the content of the ICD-11 MMS is planned to remain stable until January 2019, when it will be prepared for presentation at the May 2019 World Health Assembly. The Proposal Mechanism will remain open for submission of new proposals from the MSAC, CSAC and public stakeholders. There is a backlog of over 1300 proposals waiting to be processed. ICD Revision might potentially post new proposals for PVFS, ME and CFS via the Proposal Mechanism at any point in the future. My interpretation of the Reference Guide is that relocation of a category to another chapter would constitute a “Change a primary parent” and a “Structural Change” and would be classed as a “Major Change”, for incorporation on the 5 year update cycle, not the annual update cycle. It is not yet clear in which year the first update cycle is anticipated to start, i.e., whether the next stable release would be published in January 2020, or if the first update cycle is not scheduled to start until a later year. How soon will member states start using ICD-11? World Health Assembly endorsement will not come into effect until January 01, 2022. After this date, member states can start using ICD-11 for reporting data when their health systems have transitioned to the new edition. Dr Christopher Chute, chair of ICD-11’s Medical and Scientific Advisory Committee (MSAC), predicts that early implementers may require at least five years to prepare their countries’ health systems for transition. Member states using a “clinical modification” of ICD are likely to take longer to develop, test and roll out a country specific adaptation — particularly the United States. There is no mandatory implementation date — member states will migrate to ICD-11 at their own pace. Global adoption will likely be a patchy and prolonged process and for a period of time, the WHO will be accepting data reported using both ICD-10 and the new ICD-11 code sets. No countries have announced tentative implementation schedules. Until the UK has implemented ICD-11, the mandatory classification and terminology systems for use in the NHS are ICD-10 (Version: 2015) and SNOMED CT UK Edition. 4 8E49 Postviral fatigue syndrome, ICD-11 (Mortality and Morbidity Statistics) Maintenance Platform. Accessed August 14, 2018 The content made available here is not a released version of the ICD-11. It is a work in progress in between released versions. In the World Health Organization’s ICD-10, Postviral fatigue syndrome is classified in the neurological chapter of the Tabular List (at G93.3, under parent block: G93 Other disorders of brain, in Chapter VI: Diseases of the nervous system). Benign myalgic encephalomyelitis is the inclusion term under Postviral fatigue syndrome and takes the same code. Chronic fatigue syndrome isn’t included in the Tabular List but is indexed in the Alphabetical Index to the G93.3 code. ICD-10 and ICD-11 do not include the composite terms: “myalgic encephalomyelitis/chronic fatigue syndrome”, “ME/CFS” or “CFS/ME” and composite terms will not be used in this report. In Post #339 I reported on the release, in June 2018, of an “advance preview” version of ICD-11. This version has been released to enable countries to evaluate the new edition, plan for implementation, prepare translations and begin training health professionals. The WHO still has a lot of work to do before the full ICD-11 “implementation package” and companion publications are completed. ICD-11 is scheduled for presentation at the World Health Assembly (WHA) in May 2019 for adoption by member states but WHA endorsement won’t come into effect until January 01, 2022. After that date, member states can begin using the new edition for data reporting — if their health systems are ready. There is no mandatory implementation date and member states will be migrating to ICD-11 at their own pace and according to their countries’ specific timelines, requirements and resources. The progression of these three ICD-10 categories through the ICD-11 drafting process has been shambolic, mired in obfuscation, immensely frustrating for stakeholders — and still not resolved. May 2010: The ICD-10 parent class, Other disorders of brain, is retired for ICD-11. Its retirement affects a number of categories that sit under it, not just Postviral fatigue syndrome. A change of hierarchy between the three terms is proposed (Screenshot). 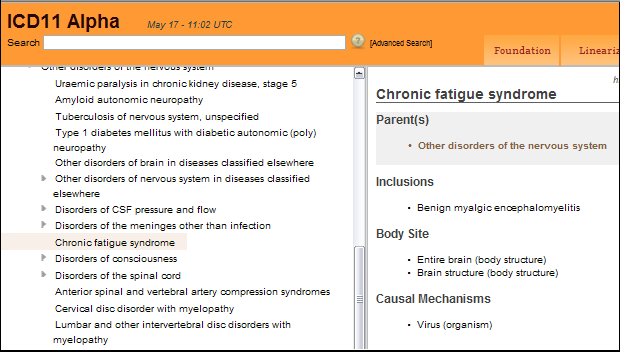 Chronic fatigue syndrome is proposed to replace Postviral fatigue syndrome as the new “Concept Title” term, with Benign myalgic encephalomyelitis specified as its inclusion term (Screenshot). 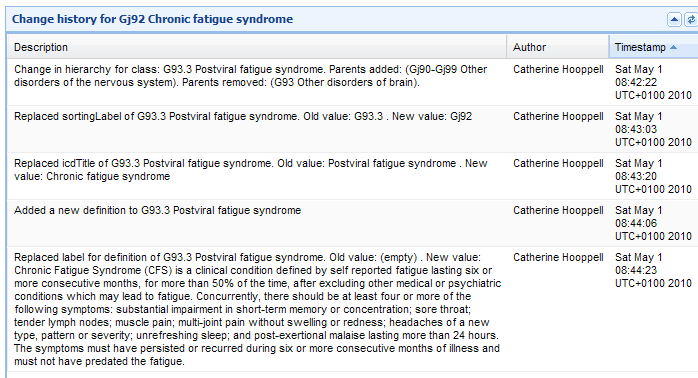 Postviral fatigue syndrome is proposed to be relocated under Synonyms to new Concept Title, Chronic fatigue syndrome. All three terms are later removed from under parent block: Other disorders of the nervous system and placed in a “holding pen” for categories for which decisions are needed to be made or while further chapter restructuring is being carried out. February 2013: The Beta drafting platform admins or the managing editors for Topic Advisory Group for Neurology inexplicably remove CFS, BME and PVFS from the public version of the Beta platform. No rationale is provided for their removal. No comments or suggestions for edits can be submitted for these terms since the terms are no longer displaying in the draft. This is how proposals for the terms had stood in early 2013, at the point at which they were removed from the public draft (Screenshot). July 2015: Following a teleconference with the WHO’s Dr Robert Jakob and Anneke Schmider, Chapman and Dimmock provide ICD Revision and Topic Advisory Group for Neurology with a list of neurological and immunological studies and other resources to inform the revision process and the literature review. February 2017: The three terms have now been missing from the public version of the Beta drafting platform for over four years. Advocates and international patient organizations lobby the co-chairs and members of the ICD Revision Joint Task Force to place the matter of the continued absence of these terms from the public Beta draft on the agenda for the Joint Task Force’s February 20-22, 2017 meeting, in Cologne. These appeals do result in the matter being tabled for discussion, as noted in the Meeting Report (Item 39, p39). But no immediate action is taken to restore the missing terms to the Beta draft and no progress report on intentions for these terms is forthcoming. At this point, ICD-11 has been under development for nearly ten years but Topic Advisory Group for Neurology has yet to publish any progress reports on its proposals for these ICD-10 categories. March 27, 2017: Suzy Chapman and Mary Dimmock finalize and submit a detailed proposal and rationale for PVFS, BME and CFS via the Beta draft proposal platform. This submission meets the March 30, 2017 proposal deadline. The proposal and rationale is supported by international patient organizations and patients. Click to download a PDF of the Proposal and Rationale. November 06, 2017: A new proposal for these terms is posted by Dr Tarun Dua. Dr Dua is Medical Officer, Program for Neurological Diseases and Neuroscience, Management of Mental and Brain Disorders, WHO Department of Mental Health and Substance Abuse. This WHO department has responsibility for both mental disorders and neurological diseases. Its Director is Dr Shekhar Saxena. Dr Dua had acted as lead WHO secretariat and managing editor to the Topic Advisory Group for Neurology, which had been chaired by Prof Raad Shakir. Is this proposal the outcome of a now concluded literature review and do these recommendations already have the approval of ICD Revision? Or does this proposal represent only the position of Dr Dua or the Department of Mental Health and Substance Abuse? but neither Dr Dua, Dr Saxena or (what remains of) TAG Neurology will provide any responses to requests for additional clarifications. The proposal recommends that “Myalgic encephalitis/Chronic Fatigue Syndrome (ME/CFS)” [sic] should be removed from the Diseases of the nervous system chapter and reclassified in the Symptoms, signs chapter, as a child under Symptoms, signs or clinical findings of the musculoskeletal system. It is not evident from the proposal what Dr Dua/TAG Neurology intends to do with the current Concept Title, Postviral fatigue syndrome — which the proposal does not mention, at all. Nor can it be determined what new hierarchy is being proposed between the terms. Nor is any rationale provided for using different nomenclature to the existing ICD terms. Leaving aside the proposal, per se, the rationales that accompany it, the misconceptions contained within it and the narrow range of studies it relies on, the submission is sloppy and not fit for purpose. “When there is sufficient evidence and understanding of the pathophysiological mechanisms, diagnostic biomarkers, and specific treatments, the syndrome can be appropriately classified within the proper block. One also has to question why this proposal was submitted at this point when advocates had been advised several times that an in-house evidence review was in progress. This proposal from a staffer in the Department of Mental Health and Substance Abuse (submitted apparently on behalf of a retired external advisory group) appeared to sit outside that evidence review. But when questioned about the proposal’s status, no-one within WHO seemed to want to have to acknowledge its existence or clarify whether and how it related to the evidence review. Yet this proposal submitted by Dr Dua proposes to do just that. Evidently, there is a lack of consensus between the WHO’s senior classification lead, Dr Robert Jakob, and Dr Dua/TAG Neurology. Dr Dua’s proposal also fails to take into consideration WHO/ICD-11 guiding principles on relocation of legacy terms to other chapters. For an expanded commentary on ICD-11 principles concerning potential relocations see Extract from Response to Dr Dua Proposal of November 6 2017. 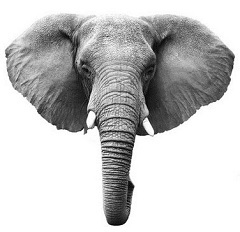 Nor do the recommendations consider any proposed relocation in the context of data collection, statistical analysis and backward compatibility with ICD-10 and its clinical modifications.